Every couple of years we decide to plant a garden in our backyard, and this is one of those years. The thought of fresh tomatoes and peppers blocks out the memories of past painful experiences. Like the vision of holding a newborn in their arms helps women forget the pain of childbirth long enough for them to face it all over again. We are not as ambitious as we used to be—no more overripe corn, mammoth watermelons, pea-size strawberries, grape vines enveloped in a cloud of yellow jackets. We keep it simple. Tomatoes. Peppers. Maybe some herbs. With experience comes wisdom. Or exhaustion. Sometimes both. 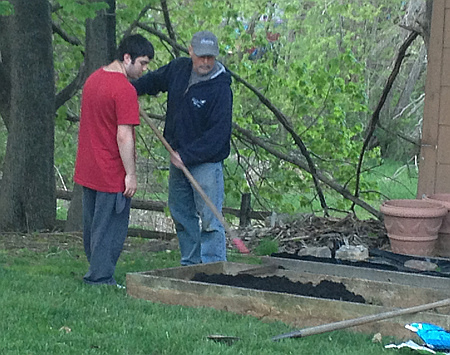 Before dumping the soil, I wanted to move one of the raised beds—we have two—from the front of the house to the back. While I was working on removing old nails from the boards and nailing them back together, Clay handed me a 10-pound bag of plant food I had dumped next to the bags of soil. Uh-oh. I didn’t think he saw me hiding the gardening supplies. Who was I kidding? Old eagle eye misses nothing. I put the bag back, blocked off access between the two sides of the garage using a wheelbarrow and went back to work. Two minutes later I heard thumping in the garage over the sound of my hammering and then Clay was standing there offering me the bag of plant food again. He had moved the wheelbarrow to the middle of the garage. I put the bag back and pushed the wheelbarrow back into place. Three minutes later, the little guy was offering me the bag of plant food again. The wheelbarrow was all the way out of the garage and up the path to the patio. We repeated this little drama maybe three more times until I finally stashed the bag of plant food into the basement behind a locked door. Problem solved, right? I checked on the progress of a bag of mini tater tots in the oven, and stomped back outside. The garage door was open. The wheelbarrow was out on the path to the patio again. And Clay had moved one of the bags of soil to the middle of the first raised bed. I stood there looking at that for a moment. He had just been trying to help. Without my asking, he had moved one of the bags to where I needed it. He wanted to be part of the project. The same as when he kept wrestling the hammer away from me while I was nailing the bed together. He wanted to show me that he could be of assistance in some way if I gave him a chance. Lesson learned. In past years, he helped mostly by devouring the tomatoes directly from the vine—ripe or not, smiling while the juice and seeds ran down his chin. This year, I’m putting him to work. This entry was posted on May 14, 2014, 7:33 am and is filed under Communicating, Daily Life, Silly Behaviors. You can follow any responses to this entry through RSS 2.0. You can leave a response, or trackback from your own site.